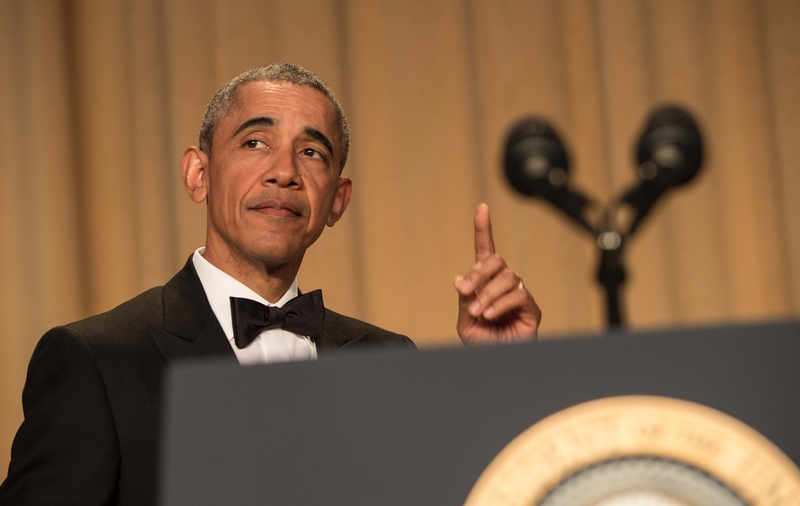 President Obama held his last White House Correspondents' Dinner Saturday night, and his remarks were a bittersweet farewell to the last eight years. As you can see from the transcript of Obama's final White House Correspondents' Dinner address, which comes at the tail end of this wild presidential primary season, Obama also poked some fun at the Republican Party and its leading candidates, particularly the business man-turned-demagogue Donald Trump. Before we try to imagine next year's dinner with Trump at the helm, let's take some time to celebrate Obama, whose historic presidency also seems like the last bit of sanity left in American politics. Led by Nightly Show host Larry Wilmore, this year's dinner brought some edgy humor — and not just from the popular comedian. Never one to miss a comedic opportunity, Obama showed off a "Couch Commander" cameo from John Boehner; cracked a few hard-hitting jokes about Donald Trump and the state of the GOP establishment; and took aim at Hillary Clinton and Bernie Sanders alike. During his address, Obama also reflected on the highs of his presidency, and ended on a somber note. Although his eight years in the White House have been rocky, with congressional gridlock and a rising ultra-right party, the president seems satisfied with his tenure. It's good to know that despite everything, Obama hasn't lost his cool. Eight years ago, I was a young man, full of idealism and vigor, and look at me now. (Laughter.) I am gray and grizzled, just counting down the days 'til my death panel. (Laughter and applause.) Hillary once questioned whether I'd be ready for a 3 a.m. phone call — now I'm awake anyway because I've got to go to the bathroom. (Laughter and applause.) I'm up. And here's the thing: I haven't really done anything differently. So it's odd. Even my aides can't explain the rising poll numbers — what has changed, nobody can figure it out. (Slide is shown.) (Laughter and applause.) Puzzling. Look, I've said how much I admire Hillary's toughness, her smarts, her policy chops, her experience. You've got to admit it, though, Hillary trying to appeal to young voters is a little bit like your relative just signed up for Facebook. (Laughter.) "Dear America, did you get my poke?" (Laughter.) "Is it appearing on your wall?" (Laughter.) "I'm not sure I am using this right. Love, Aunt Hillary." (Laughter and applause.) It's not entirely persuasive. I know that there are times that we've had differences, and that's inherent in our institutional roles — it's true of every President and his press corps. But we've always shared the same goal — to root our public discourse in the truth; to open the doors of this democracy; to do whatever we can to make our country and our world more free and more just. And I've always appreciated the role that you have all played as equal partners in reaching these goals.